Time to find out what kinds of things you can do on LinkedIn. Here are a few topics you need to know about to get your foot in the LinkedIn door and really make the site start working for you. On LinkedIn, you can build your own brand. Your name, your identity, is a brand. It’s your professional reputation. Companies spend billions to ensure that you have a certain opinion of their products, and that opinion, that perception, is their brand image. You have your own brand image in your professional life, and it’s up to you to own, define, and push your brand. Most people today have different online representations of their personal brand. Some people have their own websites, others create and write blogs, and others create profile pages on sites like Facebook. 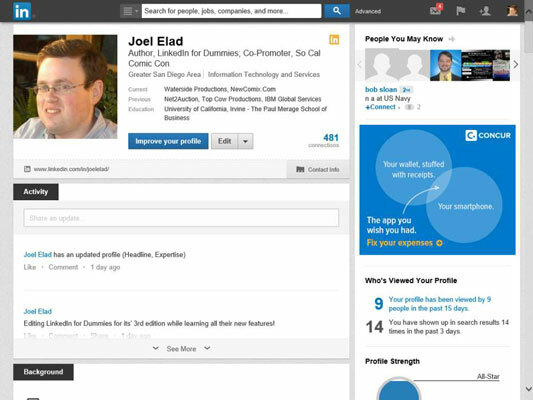 LinkedIn allows you to define a profile and build your own brand based on your professional and educational background. List any groups you belong to. Show any memberships or affiliations you have. Cite honors and awards you have received. Identify any patents or certifications you have earned. Provide links to any publications you’ve written or published. Give and receive endorsements of people’s skills. Give and receive recommendations from other people. Upload presentations, graphic design projects, or portfolio examples for others to view. Post website links to other parts of your professional identity, such as a blog, a website, or an e-commerce store you operate. The best part is that you control and shape your professional identity. You decide what the content should be. You decide what to emphasize and what to omit. You decide how much information is visible to the world and how much is visible to your first-degree connections. The hidden power of LinkedIn is that it helps you find jobs you weren’t looking for or applying to directly. This is when you’re a passive job seeker, currently employed but interested in the right opportunity. Companies can run detailed searches to find the perfect candidate with all the right keywords and skills in his profile, and they then contact the person to see whether he is interested. LinkedIn users demonstrate their capabilities by providing knowledge on the site, which gives companies insight into the passive job seeker’s capabilities. It also hosts an extensive network of groups on the site. Each group runs its own “discussion board” of conversations, where LinkedIn users can pose a question or start a conversation, and other LinkedIn members can provide insight or link to relevant articles and continue the discussion. Companies can review a person’s profile to do reference checks ahead of time and interview only people they feel would be a great match with their corporate culture. Employed individuals can quietly run their own searches at any time to see what’s available, and they can follow up online without taking off a day for an in-person or phone interview. LinkedIn research shows that “People with more than 20 connections are 34 times more likely to be approached with a job opportunity than people with fewer than 5 connections.” Therefore, your connections definitely influence your active or passive job search. Beyond getting information about your job search, you can use the immense LinkedIn database of professionals to find out what skills seem to be the most popular in a certain industry and job title. You can learn how many project managers live within 50 miles of you. You can even find current or past employees of a company and interview them about that job. LinkedIn now has hundreds of thousands of detailed Company pages that not only show company statistics but also recent hires, promotions, changes, and lists of employees closely connected with you. LinkedIn helps you identify and contact members of other people’s professional networks, and best of all, you don’t have to contact them via a cold call, but with your friend’s recommendation or introduction. In addition, you can find out more about your new contact before you send the first message, so you don’t have to waste time figuring out whether this is someone who could be beneficial to your network. You can also meet new people through various groups on LinkedIn. LinkedIn Groups help you connect with other like-minded members, search for specific group members, and share information about the group with other members.